Cuban President Raúl Castro headed a meeting of the National Defence Council to assess response and recovery measures after last year’s Hurricanes Gustav, Ike and Paloma. “We have been able to reduce loss of human life, but material damage continues to be quite significant given accumulated vulnerabilities in almost all sectors and in the infrastructure of the country. Therefore we need to speed up studies on how to reduce the gradual and progressive identified weaknesses, and once these are concluded, implement more effective protection measures,” said Raúl, who also heads the National Defence Council. 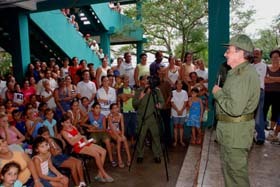 Raul said that an analysis took place from November 2008 to February 2009 and produced reports detailing recovery efforts, especially in the housing and agriculture sectors, from the Provincial and Municipal Defence Councils, National Defence Council agencies, the Revolutionary Armed Forces (FAR) and the Ministry of the Interior (MININT). He said the assessments reveal that preventative and systematic measures undertaken during normal conditions reduces vulnerabilities, risks and economic repercussions, but also identified some vulnerability. Attending the meeting presided by Raul were the heads of work groups and agencies from the National Defence Council; presidents and vice presidents of the provincial and municipal Defence Councils; and leaders from the Communist Party, the government, the FAR and MININT. Raúl acknowledge the work carried out during and after last year’s rash of hurricanes by the various defence councils and leadership, and especially by the people and concluded by saying that we have to work even harder to prepare for this year’s hurricane season that is just around the corner.